In 1826-7 the House of Commons in London arranged for a report to be complied on the state of Irish Education. This was the Commission of Inquiry into Education and is available on the House of Commons (British Parliamentary papers) website. The report is by parish and includes the name and location of each school. the pupil numbers, by religion, whether it is supported and by what organization, whether scripture is read. The teachers are given with their pay and whether housing is providedi. A summary of certain counties of teachers details was done i 1882 by Dorothy Rins Dingfelder of California and E.J .McAuliffe and this is in the National Archives in Dublin. 1754 December 29 Robert the child of William and Amiah Orchard was baptised James Good and Richard Shorten G.F. Mary Atkins G.M. 1755 January 5th Elizabeth the child of Thomas Nash was baptised Richard Morgan and Peter Williams G.F. Ann Stanly and Catherine Good G.M. 1755 February 2nd William the child of Thomas and Jane Sutten was baptised. Henry Wright and John Good G.F. Abigail Alworth G.M. March 16th John the child of Benjamin and Mary Shorten was baptised. Robert Paret and James Stanly G.F. James and Mary Stanly G.M. May 25th Susanna the child of Michael and Elizabeth Wren was baptised. John Wren G.F. Ann Stanly and Elizabeth Shorten G.M. 1755 June 8th Ann the child of Thomas and Ann Woods was baptised Thomas Bratfield G.F. Mary Nash and Elinor Bratfield G.M. October 19th Catherine the child of James and Mary Stanly was baptised. Roger Morgan and Thomas Tanner G.F. Catherine Welsh G.M. November 19ht Elizabeth the child of John and Elizabeth Bennett was baptised, John Paret G.F. Ann Ducket and Elizabeth Mamett G.M. July 25th Mary the child of Thomas and Mary Good was baptised Thomas Wood G.F. Catherine Bratfield and Mary Stanly G.M. September 26 Elizabeth the child of Cornelius and mary Dinneen was baptised, Stephen Shorten and Thomas Welch G.F. Sarah Mongan and Mary Dinneen G.M. September 25th Richard the child of John Moxly was baptised John and Will Moxly G.F. Catharine and Elizabeth Stanly G.M. October 9th Alice the child of John and Elizabeth Bennett was baptised George Horneybrook G.F. Jane and Alice Nebbett G.M. December 18th Elizabeth the child of William Malefont was baptised Robert Bothore and Thomas Crowly G.M. Susanna Good G.M. February 18th Anne the daugher to James and Susanna Stanly of the parish of Kilbrogane was baptised. John Stanly G.F. Ann and Ledy Stanly G.M. 1776 March 31 Mary Crowley was baptised Richard Battfield G.F. Ellin Millore and Sarah Good G.M. APril 31 Mary the daughter of Richard and Ann Shorten was baptised Stephen Shorten G.F. Mary Kenny Kaimer? Shorten G.M. October 20 Mary the daughter of John and Mary Wood of the parish of Kinnegh was baptised Christopher Wood and James Shorten G.F. Susanna Wren and Mary Kenny G.M. 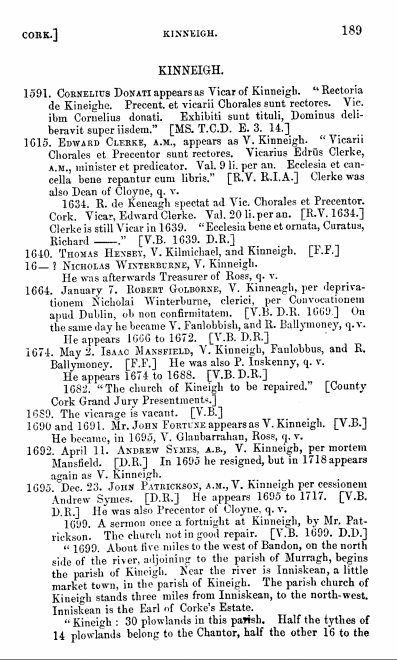 August 30th Thomas the son of Thomas and Sarah Seabery was baptised Henry Smyth and James Stanely G.F.
Jane the daughter of John and Mary Wood of the parish of Kinneigh was baptised February 21st Rev. Shorten Junior G.F. Jane Shorten and Elizabeth Keny G.M. April 11th John the son of James and Margaret Shorten of the parish of Kinneigh was baptised John shorten elder and stephen Shorten G.F. Mary Shorten G.M. July 18 Nanny the daughter of Will and Ann Tanner was received into church Richard Bradfield G.F. Elizabeth Good G.M. Mary Murphy G.M. July 18 Mary the daughter of William and Rebecca Bratfield was baptised John Milliard G.F. Jane Tanner G.M. Ann Tanner G.M. November 14th Ann the daughter of David and Ann Stanley was baptised Ben. Shorten Junior and Joseph Lean? G.F. Mary Shorten dn Ann Stanely G.M. November 26 William the child of Thomas and Sarah Seabury was baptised John wood and Will Seabury G.F. Mary Seabury G.M. Jane Eagd. 3 yeas Rd. 1781 April 22nd Ledgy Eagd one year the daughter of James and Susanne Stanly of the parish of Killbrogan was received into church James Stanly Cddt, William Edy G.F. Ann Stanly Cathoran Satanly G.M. June 3rd Edward the son of Will and Ann Tanner was baptised Michael Milliard William Braatfield G.F. Sarah Welsh G.M. 15th Will: the son of WIll and Rebecca Shorten of the parish of Kinneigh was baptised James Shorten Ben Shorten G.F.
February 24th Mary the daughter of James and Margaret Shorten of the parish of Kinneigh was baptised John Shorten Younger G.F. John Shorten son of Ben Rebecca Shorten Elizabeth Kenny G.M. William son to the sem parents aged two years was received into church Stephen Shorten Richard Shorten Benjamin Shorten Junior John Connell G.F. Mary Keny Margaret Shorten Mary Shorten G.M. April 7 John son of Will and Elizabeth Conner was received into church aged a week Wll Tanner and Thomas Bratfield G.F. Mary Welsh G.M. May 12th Chanty the daughter of Silvester and Elizabeth Payn was baptised John Love Samuel Buck G.F. Elizabeth Buck G.M. May 19th Joseph son of Joseph and Rebecca.. Peyton of the parish of Ballymoney was baptised William Mc Cullogh and George Tanner Junior G.F. Ann Brown G.M. August 25 Benjamin the son of Benjamin and Mary Roberts of the parish of Kinneigh was baptised Richard Shorten Humphrey Coughlan G.F. Susanna Shorten Elizabeth Fierbus G.M. 1782 September 15th William the son of William and Fabell? Buck was baptised Sill Pine Will Seabry G.F. Elizabeth Buck G.M. December 22nd Thomas the son of Thomas and Sarah Wilson was baptised Thomas Ware Esq., the younger Mr.John Good Young G.F. Miss Susanna Good G.M. December 29th Richard the son of Richard and Frances Tiner of the parish of Kinneigh was baptised Thomas Tiner ..(Christian name not filed in) Wren G.F. Mary Wren G.M. February 16th Benjamin son of John Shorten of the parish of Kinneig was baptised James and John Shorten Junior G.F. Mary Kenney G.M. G.M. 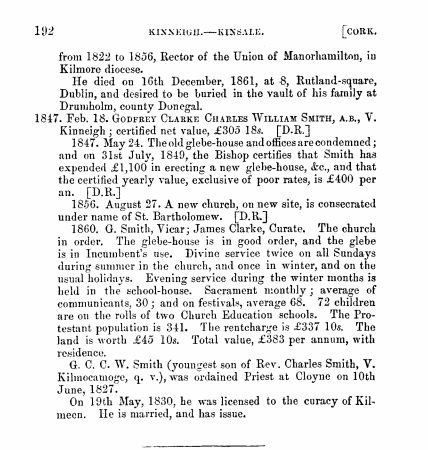 18 Daniel Henesy of the parish of Kinneigh stewart to Thomas Bernard Esq. was buried aged..
July 1st Mary Parett widow was buried aged.. Ally Morges, Elizabeth Good, Jane Carthy, Elizabeth Knowls, Mary Good, Richard Twogood, Robert Knowles otherwise Gash, Elizabeth Bennett otherwise Cooms. Ann Coombs. 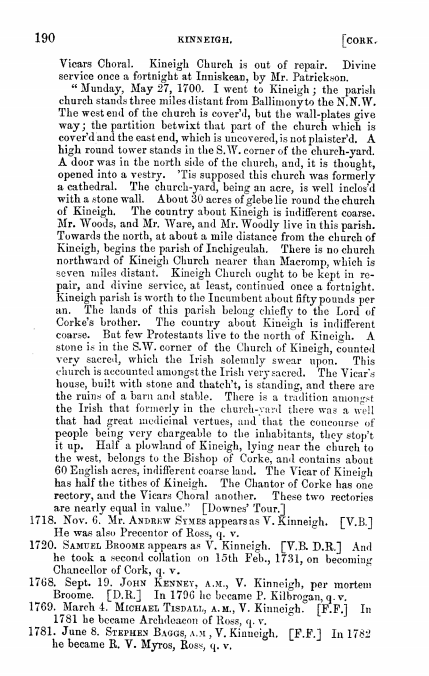 At a vestry summoned legally and held in the church of Murragh for the parishes of Murragh and Kilowen on Wednesday the 7th June 1780 it was agreed that John Wren of Dromovean and Stephen Welsh of Killinear both in the parish of Murreagh are proper persons to serve as trustees of foundlings and they are hereby elected into the service. Given under our hands August 18 1795 Walter Bullen, Stephen Shorten, James Roberts, Joseph Bennett, Herbert Gillman. April 5 Thomas son of Thomas and ..(Mother’s name blank) Burchell of Dromavane,By same. August 28 Eliza Jane daughter of Benjamin and Marianne Lane of Farnalough by same. November 30 Robert, son of William and Martha Splaine of Farren thomas by same. 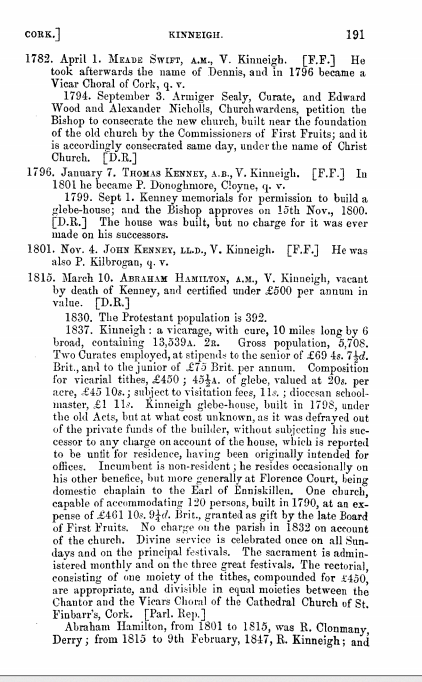 March 23 Thomas son of Benny and Susan Seabury of Kilonean by same. November 15 Thomas John son of Thomas and Anne Hegarty of Murragh by same. April 3 John son of william and Catherine Stanley of Tullyglass by Rev J.T.Ruby A.M.
May 7 Elizabeth Mary daughter of George and Sarah Lovell of Killinear, by same. …ber 1st Fanny daughter of Orpen and Susan Sarah Beamish, Medical Doctor, enniskeane, Kinneigh, John Haines Rector. January 30th Eliza daughter of William and Mary Anne Tiner, farmer, Copeen, Kinneigh, John Haines, Rector. June 29th William Alexander son of George S and Annie Wood salesman, Farm Mills, Desert, John Haines Rector. September 2nd Rebecca daughter of Nathaniel and May Northidge (spelled thus) farmer Ballyvolone, Kinneigh John Haines Rector. 29th August Thomas son of ..Shorten Kilnacronogh, farmer, Kineigh, John Haines Rector. May 14th Susan daughter of Paul and Mary Ann Shorten farmer Monagave Kinneigh John Haines, Rector. June 17th Frances daughter of Robert and Sarah Tiner Copeen Kinneigh farmer. Rev, St. J F Rector of Be..
November 26th Alfred James son of Richard and Mary Jane Wood Castlelands Kinneigh farmer John Haines Rector. March 21st Thomas Gash River View, 70, John Harris Curate. Shorten… (left blank) son of William…. December 6 Tamar publically daughter of Richard and mary Anne Shorten Kilnacron..
October 5th William son of ..rge and ..an Payne farmer Ballyvalone parish of Kinneigh Alex Stuart Vicar of Kinneigh Archdeacon of ..
January 9 Mary Nagle Lisnabunny 36? no entries for 1875 1876 error for 1875? The records were transcribed my Margaret Griffith, Assistant Keeper in teh Public Records Office, Dublin 1961 from papers deposited by the Rector. The North Cork Militia were on the Government side in 1789 in Wexford. They were predominately Irish Speaking, in contrast the Insurgents had no Irish. The Bantry Estate records have a William Dealy eldest son of Michael and his brothers Samuel b 1800, Michael 1803 names as lives in a lease. 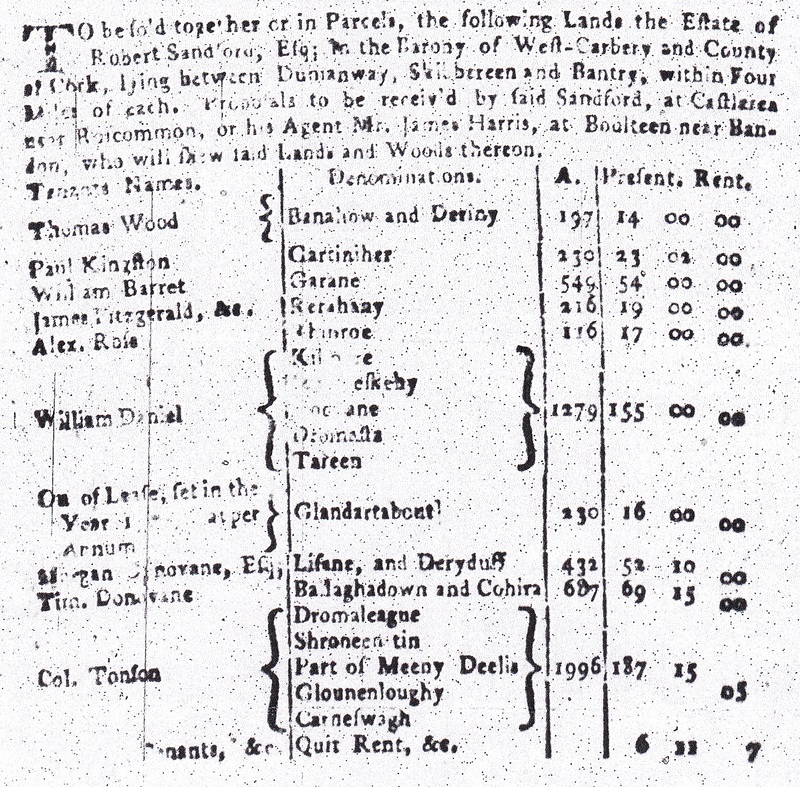 It is possible that the Bantry Dealys/Dalys are connected with the Landowning East Galway family of the 18th century powerful in politics as were the Gores with whom they were intermarried. This could account how many of the Bantry Dealys ended up in State positions as Customs and Fisheries in St. Johns, New Brunswick in the early 19th century. 1819, Michael Dealy, Gent, conveyed to Paul Kingston, shopkeeper, Bantry and William Dealy, his brother, then of H.M. boat Kedal?, part of lands at Dromkeal, Bantry, together with farming and fishing and fish curing utensils. I have inst. rec 3 newspapers from you. (The last date 22nd Augt. 1840.) I wrote several times to you, and to W. Burns since the “Dealy’s” return on the 2nd July 1840. My letters were forwarded (I understood) by Steven Vessels and I am therefore surprised that they did not reach you before the S 22nd August. I also wrote per the “Dealy” which sailed from here on the 1st August 1840 for Quebec, both to W. Burns and yourself & hope, before the present date, that these letters have reached their destination. I was rather lucky, considering the slack state of trade here this season, to secure a Charter from my neighbour W. Riordan of Kenmare for a cargo of Timber & deals from Quebec – as the delivery there is next thing to being at home with me. sales at Bantry of Timber & deals have been nearly nonexistent I hope the prospect of a good harvest will cause a general improvement. Please to present my Compts to W. Burns & inform him that I paid his bill for the “Dealy’s” cargo on the 5th Inst- at the present moment I have nothing worth perusing to communicate but will shortly write to him. I purpose, with God’s assistance, to send the “Dealy” to St John’s very early next season with passengers – but as we have now a greater facility of sending letters. I will communicate frequently with on the subject during the Winter. We have strong rumors of a general war, but I hope it will not take place. From the number of vessels which took out immigrants last year all our Irish markets are overstocked with American timber and the prices are consequently very low – with an additional duty layed on – that with an improvished population tenders sales bad and renumeration indifferent. Private. I wrote you some disponding letters in April last. at that time I was hard pressed to meet some bills – and I was preparing to remove my boys from Rosscarbery School (Diocesan Secondary School) which would have been a severe blow to your aunt. but thank Providence I met more kind and good friends and if I can rub over another season I am in hopes that I will not owe any a man a shilling particularly if I can effect good sales & to encourage which I am offering goods on low terms. The fisheries have nearly failed here as yet this season & I hold a large stock of salt __ has improved the English market & I am a considerable holder. When you write next please to inform me particularly as to quality and price etc generally as to how barreled herrings & American tar could be shipped & whether the deck load law would prevent barrels being brought on deck. The failure of the fishing here causes me to make this inquiry although I fear there will be no chance of my getting any of these articles this year in both ____. As soon as I receive your expected letter I will write to you at all events I will do so shortly. Your mother and all your family are quite well. The new road to Bantry is nearly completed & will certainly enhance the value of Drumkeal (on road from Bantry to Ballylickey/Glengariff/Kenmare) very much. Our Dunmanway friends are all in the enjoyment of health but the___ doing very little good. Our Bantry Postmistress has been detected in forgery__ of money from letters – She made ___& was apprehended near Bristol. She is now in Gaol at Cork & will be tried at __ the next assizes. Mr and Mrs Gastry are here with us on a visit this month and they request to be particularly remembered to you, Our little family are quite well Thank God and your Aunt unites with me in kindest wishes to Isabella & yourself and we hope that your little ones enjoy good health – present our kind wishes to Wm and his family to Eliza and her family and to Paul who I hope is maintaining his place with credit. WHAT BECAME OF THE GOOD SHIP “DEALY”?THE “DEALY” OF BANTRY, 400 TONS, IS NOW BEING FITTED OUT IN A VERY COMFORTABLE MANNER FOR THE RECEPTION OF PASSENGERS AND, WIND AND WEATHER PERMITTING, SHE WILL SAIL FOR ST JOHN’S NEW BRUNSWICK, ABOUT 25TH MARCH 1847. FOR FREIGHT OR PASSAGE APPLY TO THE OWNER W.J.DEALY, BANTRY. THE “DEALY”The “Dealy”, which had been built by James Smith at Courteney Creek, New Brunswick, North America, in November 1839, and was registered at St John’s New Brunswick, 2nd December 1839, was the fifth ship to be given its certificate of British Registration at the small West Cork Port of Baltimore. The “Dealy” was a two masted, eighty-four foot, Brig, twenty one feet Breadth at Midships with fifteen feet eight tenths Depth in hold at Midships. She was Carvel built, with a square stern, one deck no galleries and was rigged with a standing bowsprit. She had a burthen of 275 942/3800 tons as measured under the Act 5 & 6 Will IX cap 56 at a tonnage of 231 76/94 tons. Somewhat short of the 400 tons advertised in the Cork Constitution! William Justin Dealy owned all 64 shares. Matthew Stirratt was the first Master (1840 – 1847). At St John’s New Brunswick, McNealy took over as Master on 30th November 1847, and on 22nd April 1848, at Skibbereen, Martin Dee became Master. The Crew Lists and Agreements record a voyage from Bantry in April 1847 to St John New Brunswick. The crew were shown as: Matthew Stirratt (Master), William O’Neill (Mate), Denis Coughlan (2nd Mate), James Barry (Carpenter), Michael Baker, Archibald Molloy and John McCarthy (Seamen), John Connolly (Cook) and Francis Whoolahan and John Donovan (Apprentices). The “Dealy” arrived on, or just before 19th June and sailed on or just after 6th July from Gloster (Gloucester), where the crew were paid off on 25th August. The “Dealy crossed the Atlantic with 7 crew and 2 apprentices. The Mate (O’Neal) had to be left in the Marine Hospital. The Carpenter (Barry) and a Seaman (McCarthy), both Articled Seamen, were reported by the Master, on 6th July 1847, as drowned after arrival in Port, at St John’s and another Seaman (Baker) died at the Quarantine Station there. With only the Master, 2nd Mate one seaman and the Apprentices for the return voyage they had to sign a new Mate (Pugh) and four Seamen. To procure Pugh’s services he had to be paid twice the wage of his predecessor. The Seamen got 5. 10s. Connolly the surviving Seaman was only getting 3 a month. Seaman Molloy, after signing on, failed to appear and was deleted from the Crew List. The Agreement was witnessed by Wm. J Dealy no less. In September 1847, the “Dealy” sailed for St John’s again, from Gloster. The crew were Matthew Stirratt from Salcombe, Master, Denis Coughlan from Baltimore 2nd Mate, Richard Henwood from Cornwall, F. Leary from Hamburg, Samuel Aldridge from New Jersey, Michael Kelly from Galway, M. Thomas from London, Saul Profsen St Davids, John O’Brien, Bantry, John Riley Liverpool and Charley Allen, Galafoh were the seamen. Arriving on or just before 1st November, the Master and 2nd Mate were the only crew continuing in the ship. A crew of 5 were recruited in Bristol, and with one (Harm) failing to join, the crew for the outward voyage with a total crew of 6. An interesting entry in the Agreement is the prohibition of sheath knives and spirits! In St John’s, Stirratt, the Master, discharged himself, the four seamen all deserted, leaving the 2nd Mate on his own. The next voyage was to St John’s again, departing in April 1848, and arriving on or just before 22nd June. Martin Dee had been confirmed as Master, and a total crew of 11 was signed, one of whom (Buckley) failed to join. Again, three deserted, one was left in hospital and the Mate (Grainger) was drowned on 27th July 1848. A new Mate, a cook and two extra seamen were signed in St John’s. The Agreement was signed, not by William Justin Dealy himself, but by John R. Dealy (his son). The Crew List again shows the places of birth: Martin Dee in Yougal, Frederick Grainger and Jeremiah Crowley Cork, Maurice Donegan Bartholemew Berehaven and John Molloy Baltimore, Thomas Davies Liverpool, Cornelius Sullivan and John Riley, Bere Island, Jermiah Sullivan and John Spillane Bantry, John McAuley Philadelphia, Peter Brown Dublin and John Hooman Ilfracombe. On or just after 20th July 1848 the “Dealy” sailed for Arbroath, arriving 15th September 1848. The Certificate of Registration is endorsed with a note of the report of the loss of the vessel which, according to Lloyd’s List of 1848 was totally wrecked off the Cornish coast on 13th November. The records show the birth places of other crew members. Matthew Stirratt and William O’Neal were born in Salcombe, James Barry in Bantry, Michael Baker, John McCarthy John Connolly and William Eagan in Baltimore, William Pugh in Reading, William Cooper and Henry Gillicuddy in Halifax, Michael Henery in Dublin John Donovan in Goleen and Francis Whoolahan in Bantry. It is believed that William Dealy also owned the Kingston. 1998 addendum by Emery C. Daly: In the book Irish Immigration to New England through the Port of Saint John New Brunswick Canada 1841-1849″ by Daniel F. Johnson I found the following arrival dates for the Brig Dealy. All voyages originated in Bantry co Cork Ireland. I don’t know where the Dealy was during 1843 and 1844 but the June 1848 voyage from Bantry to Saint John was obviously the last one across the Atlantic. They had intermarried with the powerful political Gore clan whose Dublin base was in Dominic Street, then the fashionable upper class Georgian Street of Parliamentarians and Legal Luminaries on the Northside of Dublin. They were probably in Bantry by mid 18th century at the fishing business with the Jagoes, Meades, Galweys, Murphys, Youngs and Vickeries. There was a migration of many of these Bantry families to St. Johns, New Brunswick from the late 18th century. Family memoirs of the Dealy family in NB suggest political influence in preferment. Many of the Dealys ended up in NB as Fishery Inspectors and Customs officials. The Finnyvara, Clare & East Galway Dalys share the same Y-DNA signature and we posit these Dalys were an original Teffia/Tethba branch of the Southern Ui Neill. They did have a split in the early 18th century in which the Dunsandle branch assimilated the Established Church and disassociated with their Gaelic culture to maintain their land holdings. And, indeed the Dalys who governed New Brunswick (Malachy Bowes Daly and others) were of this specific Dunsandle branch. In fact, anecdotally, they are responsible for the reference to the Miramichi River in NB as the local Shannon River, deep within the oral history of the area.